In a recent blog post we addressed the issue of safety and security on our summer school programme, something parents are naturally concerned about. Today, let’s further explore how we care for students attending Brillantmont as part of our upcoming Summer Course 2014. As touched on in our previous blog post on safety, our summer school teachers live with students to provide constant supervision and care for children of all ages. Younger students in particular, who may be attending for the first time, sometimes need a little help integrating and getting used to being away from home. Our staff will do their utmost to ensure children make friends quickly – though they rarely do need our help because there are so many fun activities to keep them busy! An on campus health service operates 24h a day and should someone need emergency hospital or dental treatment, both are within 5 minutes of school. When not in morning language classes, weekday afternoons are devoted to sports. Large groups of children are hard to supervise effectively, so students are divided up into small groups according to age. They are then led by full qualified teachers who place the safety and care of your children above all other concerns. 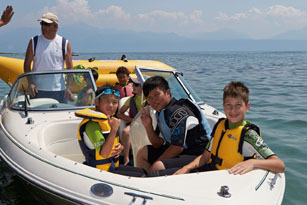 Sporting activities may include watersports like paddle and windsurfing son Lake Geneva; mountain biking and other forest activities; athletics and more typical pursuits such as football, tennis and badminton. A stay in Switzerland is inconceivable without excursions in the mountains, and we take our students on trips to discover the most characteristic Alpine resorts. They can also try out various sports, such as rock climbing or glacier walking under the supervision of experienced guides. Would you like to know more about the Summer Course 2014? Please visit out Summer Course page to request a pack containing the brochure, registration forms and other relevant information. You’ll also find details on how to contact the school with any further questions you may have about how we care for our students.